I decided to pursue light painting on a larger scale in 2010. I was inspired by the work of German photographer, Berthold Steinhilber. His light painting photography of British abbey ruins and American ghost towns was full of moody lighting and dramatic reveals. What intrigued me was the idea of working in front of the lens and not being seen by the camera. Initially I was cautious about taking my big film camera (Fujifilm GX680) outside. It was heavy and cumbersome so I adapted a backpack, with lots of padding. Then I set myself a physical safety limit — not to carry the camera and tripod more than one kilometre in any direction from the car. This sandstone wall is in a park that overlooks Sydney Harbour. Normally this park is dark at night. The red glow is a navigation beacon for harbour traffic. This scene was lit with a bright torch (flashlight) during a six-minute time exposure. I used the torch to trace the shape of the wall; sidelight the trees; skim light the paved path; and highlight the park bench. That’s the beauty of light painting! Outside the studio, I found light painting was a vastly different experience. The controlled environment of an interior was now replaced by changeable weather; a critical timeframe in which to record the fading skylight; and locations with lots of obstacles to fall over in the half-light. My “canvas” was now so large that I had to walk into the scene to selectively paint with light the features I wanted to accentuate. To remain “invisible” during the long time exposures, I wore dark clothing; constantly moved around in front of the camera; and took great care not to shine my torch (flashlight) back towards the lens. Four years on, I find shooting landscapes at dusk feeds my creative soul. It’s challenging, meditative and satisfying all at once. A deceptively simple technique that has endless possibilities. 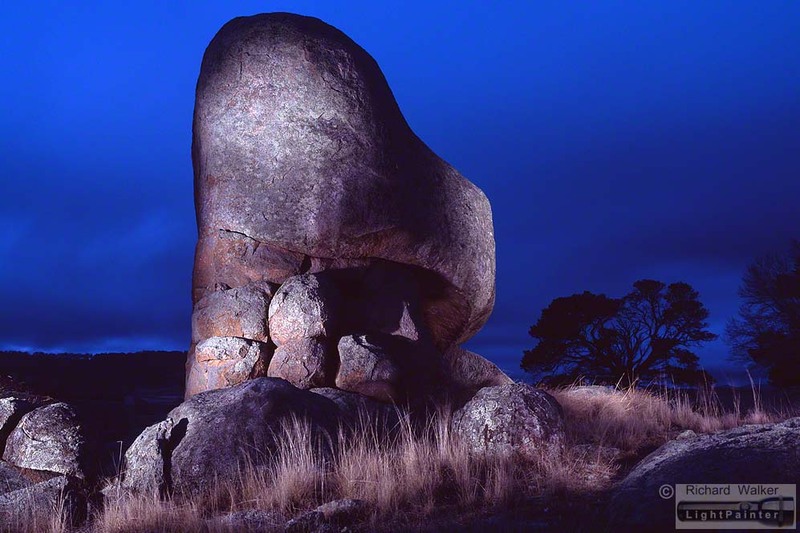 Behold a Giant — Stonehenge, near Glen Innes, New South Wales. I have an affinity with the granite country of the New England region. Perhaps it’s because my family travelled through this country for many years on our way to visit relatives in Tamworth. I’ve always loved the granite outcrops and the balancing boulders. This scene was shot during a short break in stormy weather. 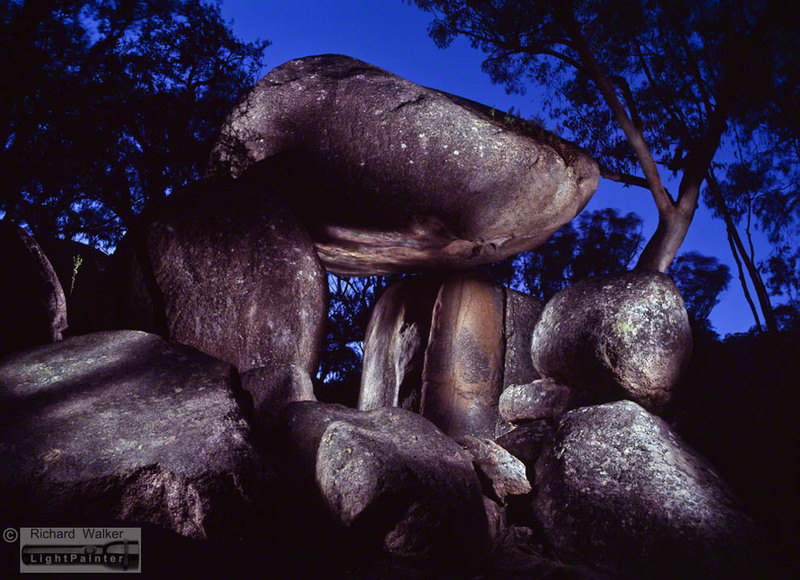 A 60-second time exposure (for the sky) enabled me to move around in front of the lens, using my torch to sidelight the boulders and foreground grass. All my exterior light paintings are shot on 120 Fujifilm T64 — a discontinued, tungsten-balanced transparency film that produces the most beautiful blue skies. I like to light landscapes in a theatrical style that produces a heightened reality. I try to create a sense of anticipation, as if something is about to happen? Will someone or something appear amongst these boulders? During this six-minute time exposure, I moved around in front of the lens, following a lighting sequence that I had thoroughly rehearsed. The great advantage of light painting within this scene was that I could light each boulder separately. There were 13 positions that I had to get to, so I could effectively sidelight each of these magnificent granite boulders and the adjacent tree. 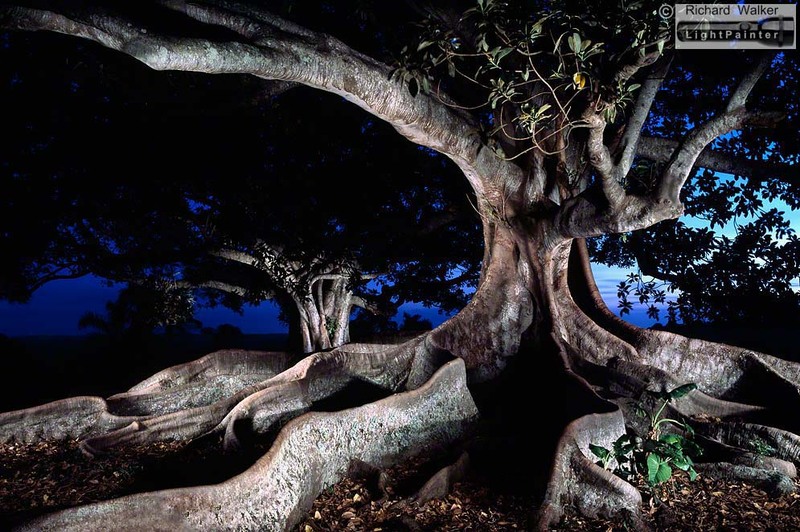 The outstretched limbs of this Moreton Bay Fig provide quiet reassurance. This tree in Sydney’s Centennial Park is home to birds, possums and the occasional homeless person. When I was scouting the tree for the best camera angle I found abandoned blankets and food wrappers jammed in between the large buttress roots. Light painting these long branches required two skills: the ability to pan the portable light at an even, smooth pace along the entire length of each limb; and the capacity to remember what had been lit and what hadn’t. I tend to count seconds in my head when I’m working on location, particularly when I’m light painting with a steady panning movement, so it is really easy to forget which part of which branch has been lit. This kind of photography challenges you to stay in the moment because you are literally revealing or hiding every element in the shot during each long time exposure! 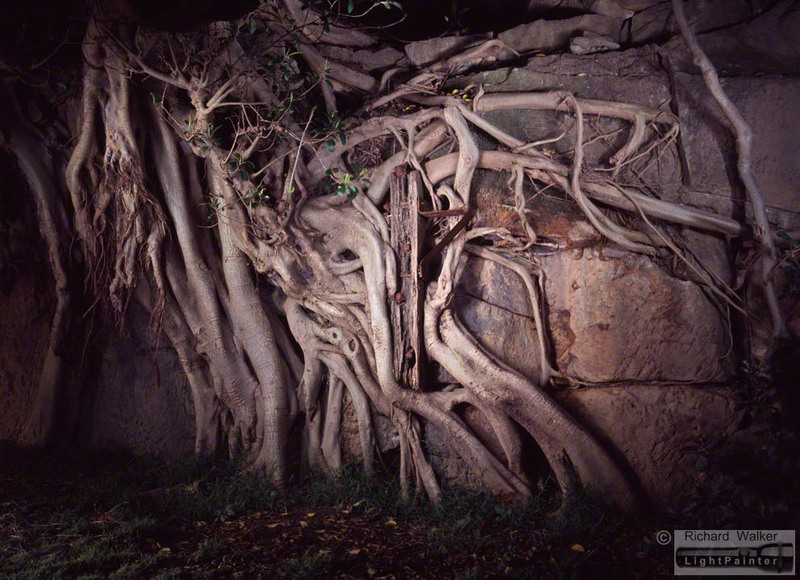 This dusk scene of a Strangler Fig taking over a host tree is the first light painting I produced outside my studio. I was visiting the North Coast of New South Wales and as I drove along a narrow country road I noticed a copse of trees on a green hillside. Originally I intended to light paint the entire copse but when I discovered this magnificent Strangler Fig within the group I realised the best shot was this view of a single tree. 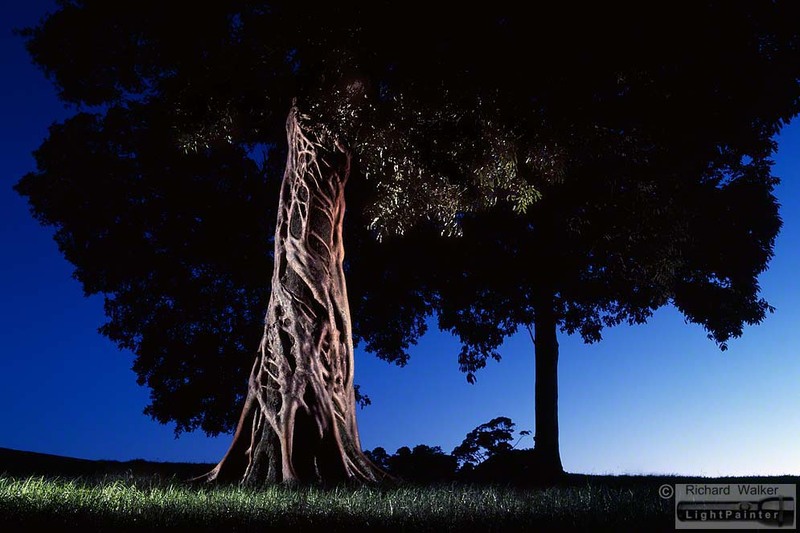 Southern Cross University has classified this Strangler Fig as a tree of significance. Shot on 120 Fujifilm T64 in 2010. I first noticed these magnificent Moreton Bay Fig Trees from a distance. Their distinctive shapes were silhouettes atop a high hill west of Lennox Head in northern New South Wales. Standing in their presence was wonderfully calming. 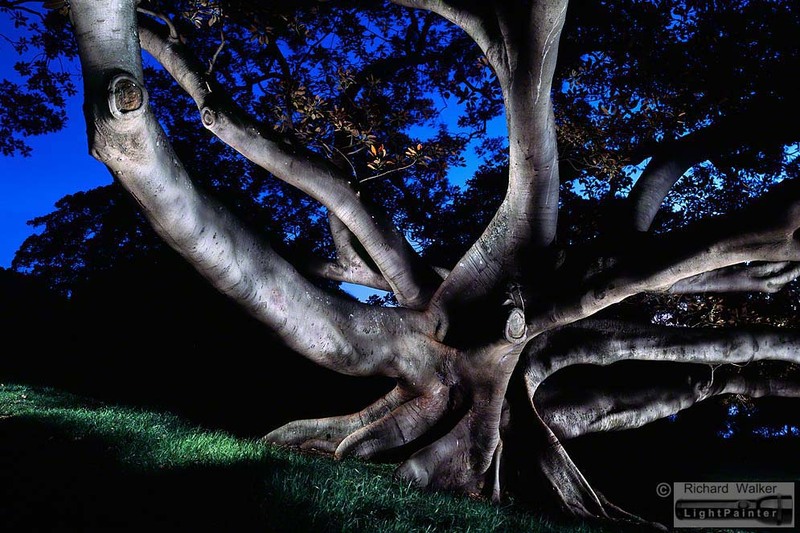 Their overarching limbs and thick buttress roots gave me a great feeling of security. These aged trees had withstood decades of storms and cyclonic winds. They were definitely here to stay! Producing this light painting was tricky. As the light in the dusk sky faded, I shot four time exposures ranging from two minutes to ten minutes. By the time I shot the last exposure, the foreground was so dark my lighting sequence became a hurdle race as I moved around close to the trees, trying not to stumble over the raised roots. I spied this rotting post against a sandstone wall in a harbourside park just west of Sydney’s CBD. I was intrigued by the way the fig tree roots were slowly encroaching on the timber post and rusty metal bracket. The theme of Nature taking over or reclaiming its domain resonated with me. In this light painting I softened my torch beam using a full diffusion filter. I wanted to focus attention on the central post and have the light fall off at the edges. Shot on 120 Fujifilm T64 in 2011. 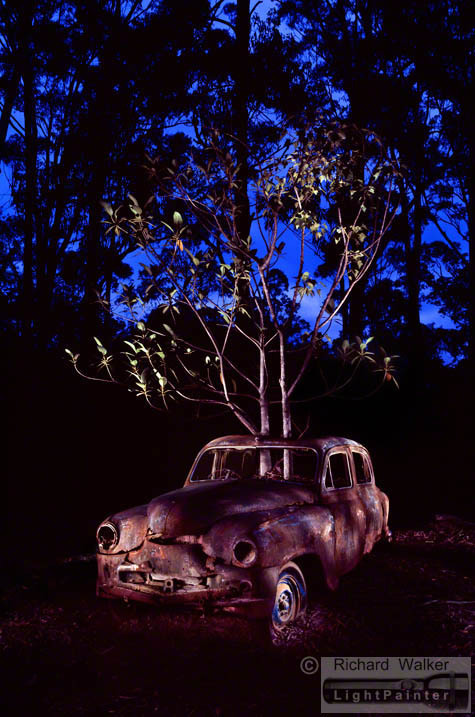 This wonderful wreck sits beside a forest road north of Kempsey on the Mid-North Coast of New South Wales. The car is a Standard Vanguard, and according to the local postmaster, it has sat at the entrance to a country property since the 1970s. The rusting hulk was fascinating in itself, but my real interest was revealing the two trees (a fig and a maple) that have grown up through the car body. The floor of the vehicle was in contact with the ground and there was a huge hole in the roof. I was amazed by the amount of leaf litter inside the car. The entire interior, up to the level of the open windows, was packed with leaves and twigs — the lower half of the old wire steering wheel disappeared into ancient mulch! A great example of Nature reclaiming territory. Very glad I found these Richard. You are a pure light painter using what you see with single Torches whereas many use Photoshop to greatly change the look and colour of the in Camera work. Hi Chris, thanks for the compliment. I get quite excited whenever I begin a time exposure on the old Fuji film camera. It’s quite exhilarating to walk in front of the lens and begin shining a light on those elements I want to accentuate. And of course, no two film frames are quite the same, so that unpredictability adds another layer to the experience.